The charts above are from the recent Politico / Harvard T.H. Chan School of Public Health Survey -- done between August 31st and September 4th of a random national sample of 1,000 adults, with a margin of error of 3.7 points. Obamacare (the Affordable Care Act) has been in effect for a couple of years now. Over 20 million Americans now have health insurance that did not have it before, people with pre-existing conditions can't be denied insurance or charged rates they couldn't afford, students up to age 26 can stay under their parents insurance plan, there is no longer a cap on medical care that insurance will pay for, and 80% of insurance premiums must go to pay for medical care. Those are all good things, and a big improvement over the system before Obamacare was passed. 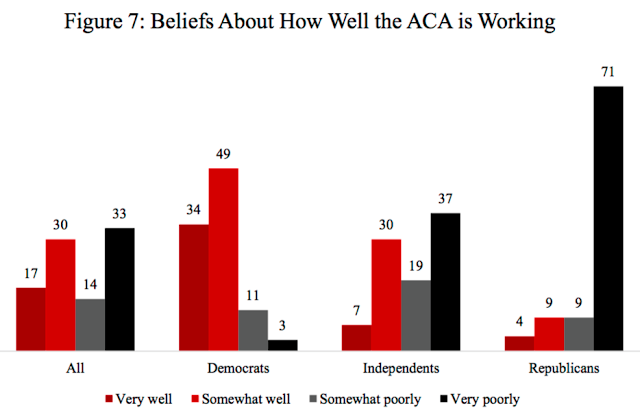 So, what do Americans think of Obamacare? It turns out that the American public is split, with 47% saying it is working well and 47% saying it is not working well -- with 83% of Democrats saying it is working well and 80% of Republicans (and 56% of Independents) saying it is working poorly. What is wrong? Why isn't there huge support (since Obamacare has been a significant improvement over the old system)? It turns out that many don't think it has gone far enough. It hasn't covered enough people, and it hasn't reduced the cost of medical care. 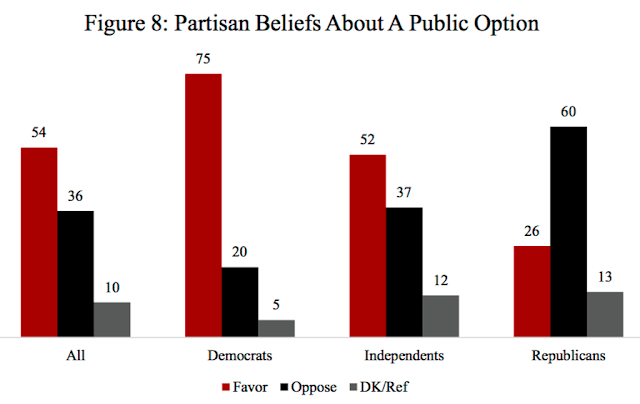 About 54% of the general public (with 75% of Democrats and 52% of Independents) would like to see a public option offered. Only the Republicans oppose that, with 60% opposing a public option. Most believe Americans should be able to opt for a government insurance plan (like Medicare) to get away from the greedy insurance companies who care more for their bottom line than for patient health. Americans are also unhappy with the cost of health care -- and they should be, since Americans pay more per capita for health care than any other developed nation. The general public, Democrats and Independents mainly place the blame for the cost on drug companies and insurance companies. Once again, Republicans are out-of-step with everyone else, most of them blaming the federal government.